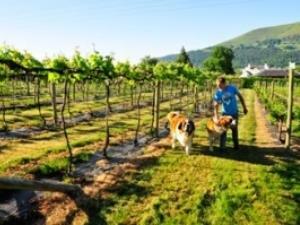 Sugarloaf Vineyards01873 853066work VineyardTake a relaxed stroll around the vineyard, through the orderly rows of vines, secure in warm fields sheltered by high hedges, beneath glossy green leaves, promising another rich harvest for the next vintage. Follow our Vineyard Trail and learn about the work we do here at Sugarloaf Vineyards. There's no need to book! It's self guided so turn up any time within our Opening Hours (see below). Please note Vineyard tours are available during the months of March - October. To avoid disappointment we strongly advise any group to pre-book we are a small business with limited seating and may not be able to accommodate parties during busy periods. Guided Tours with wine tasting are available for groups of between 8-25 people. Ideal for small informal gatherings or for groups, associations and organisations. They include a tour of the vineyard (weather permitting) and a wine tasting, lasting approximately and hour and a half. Catering can be arranged for after your tour please email or telephone to request a price list. Please note: Guided tours are usually evening tours and we do not have the seating capacity for large parties during the day time. We have a licensed coffee shop serving light refreshments, coffee & cake, cream teas or our delicious local cheese sharing platter which are perfect to enjoy with a glass of wine! We stock locally made honey and preserves & Welsh cheese. There are also vines for sale. A40 from Abergavenny towards Brecon. Pass Nevill Hall Hospital on your left, take first right after hospital signposted Sugarloaf Vineyards. First left second left third right into the Vineyard.